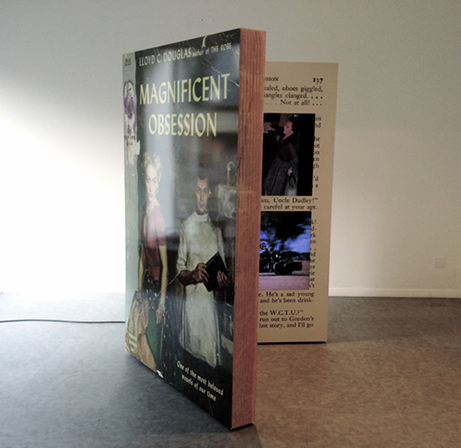 The film/art installation "MAGNIFICENT OBSESSION" is both fascinating and spellbinding. The combination of image, sound and text are poetic, so that space and time slowly become indistinct and later merge. It captures in a sensual way the many forms and functions of literature in the movies. The sophisticated editing on the 4 screens delivers at the same time and in a wonderful way the multiplicity of esthetical, intellectual and emotional impact. One is left spellbound—like from a good movie or an exciting book. There are countless of combinations of film clips to watch and to associate with literature. One turns from a spectator into a dreamer and even into a composer. A brilliant choreography, full of surprises, beautiful to watch, and totally lyrical. Made with intelligence and wit—the longer one watches the installation the more one is enchanted to discover new levels of experience and awareness. I especially enjoyed the magnificent artistic work of the titles and credits. Even John Waters would be proud of this genius combination of images, text and film clips. This work enlightens. It is pure poetry. Sophisticated and cinematographic. This is a damned fine project.